Alaska is a magical place. To see its offerings, I recommend picking a combination of travel by car, recreational vehicle (RV), ship or train. 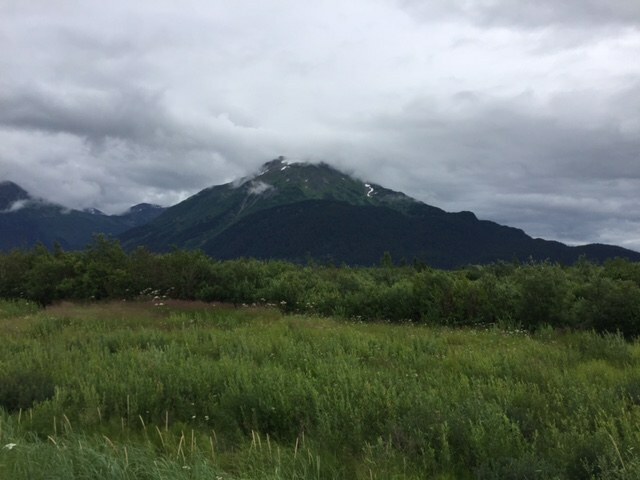 I rented a Ford Focus to explore solo and drove along Seward Highway, a 125-mile stretch connecting Anchorage to Seward, Alaska. As I hit the open road, the Chugach Mountains’ enormity and the vastness of trees and vegetation overpower me. I imagine any movement from the ground and the mountains and ocean will swallow me like a giant crocodile with fanged teeth sitting on the river’s edge, waiting to devour me. It blinds me with fear. I stop the car and spin around 360 degrees. I am small, a tiny little speck below, seen from atop the Empire State building. Traveling through Alaska’s vast landscape is overwhelming and leaves me breathless. I am nothing; the trees and mountains rule the Kingdom. 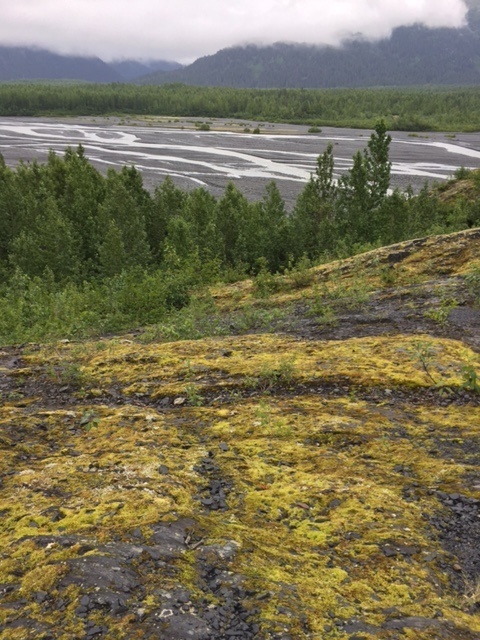 The spruce, birch, willow and cottonwood occupy the terrain. They are a rainbow of color, but green is the only crayon in the box–dirty green, emerald green, sea green, muted green, lime green. Layers upon layers of trees and bushes switch back and forth as if planned. The clouds hover over the mountains but they are not obtrusive or dark like storm clouds. They add to the mystique. The stark white boldness contrasts against blackened and grayish volcanic rock of the land. 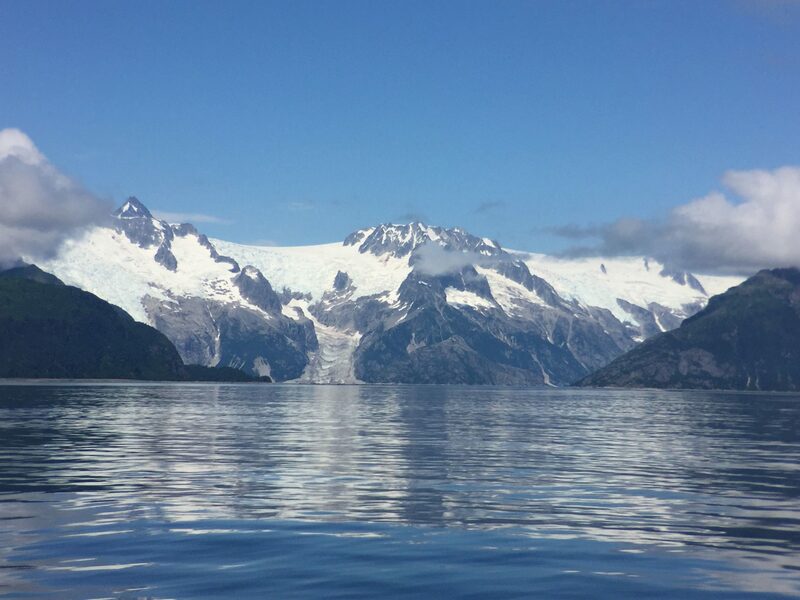 Snow and glacier-capped peaks streak like rivers down the sloping mountain fronts and the clouds blanket the crown like a woman covering her shoulders with a shawl on a cold night. 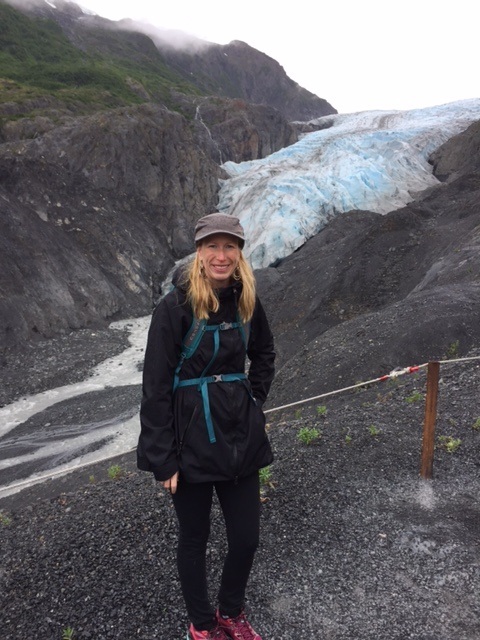 Millions of years ago, ice sheets gave way to oceans and mountains, creating plants, wildlife, sea life and a world so powerful that the road, Seward Highway, cutting through it all seems inadequate. One storm or force of nature could overwhelm the road with little warning. It cannot protect me, but the tranquility and the quiet is peaceful–welcoming, like the Alaskan people. I don’t remember a place in my travels where I felt this free, yet the force and strength of nature cautioned my every move. 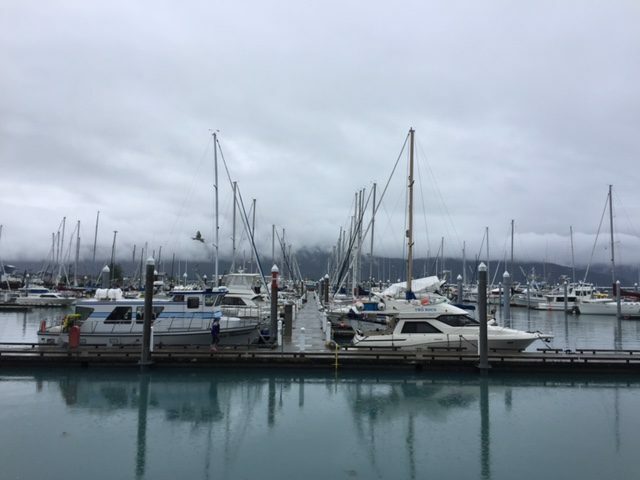 After a three-hour drive on empty roads and a gorgeous hike through Exit Glacier, I arrive in Seward, an active port town on the Kenai Peninsula where many of the cruises depart and the Alaska Railroad terminates and begins. It’s a great first taste of the open water and fjord experience. Now it’s time for me to find somewhere to stay for the night. I prefer to leave my accommodations to last minute in case I veer off the beaten path. This is not always a wise idea during the height of tourism season… or at 4:00 PM with intermittent service (no wi-fi, either) on my Verizon phone. I ignore my quandary and devour my fresh oysters and grilled halibut sandwich and start chatting with my waiter at Chinooks. “I have a friend,” he says. I roll my eyes, mentally conjuring a scene in a Stephen King novel. “But I have horrible service and I don’t see the convenient two bedroom post,” I say. He takes my phone and calls his friend. Twenty minutes later the Airbnb listing appears and I am secure for the night, rescued like a Damsel in Distress–which, I admit, happens. The Airbnb is a big winner. I am a mile from town and the accommodations, immaculate and inviting. The two-bedroom cottage, complete with writing desks, is nestled into a serene wooded area, and makes for a perfect two-day stay. My lack of planning proves worthwhile yet again. And I made a new friend. Remember back to a time or maybe an idyllic society crafted in books and movies where neighbors rely on neighbors and people help one another because they need each other to survive? Think Little House on the Prairie. I discovered this in Alaska. It exists today. Locals consume themselves with living a happy, simple and enjoyable existence while working a medley of jobs. They are not materialistic or pretentious. They live and love life. If offered a place to stay by a waiter in a restaurant in Chicago or New York City, I would presume he or she intended to trick or hurt me. In Alaska, my fear factor subsided. I became receptive to the kindness of strangers because I wanted to be. I opened my mind to trusting people, which I take for granted anywhere else normally. I am in a time warp, hypnotized by the beauty of my surroundings and the people. There is an inexplicable generosity among Alaskans.